As a believer in a young earth (though I don’t know how old that is), my answer is probably a bit too simple but my question is who knows how far these novas are from us? I understand that we measure them based on calculations and based on observance from telescopes but in the end, none of us have been to the novas and turned around to see just how far we were from them. So our observance and measurements are based on human calculations that are prone to not always be correct. We are making assumptions about how far these novas are and no one really knows. That’s a good question, Seeking Disciple. But don’t confuse novas and supernovas – they are very different phenomena. Astronomers have various ways of estimating the distances of stars and galaxies. 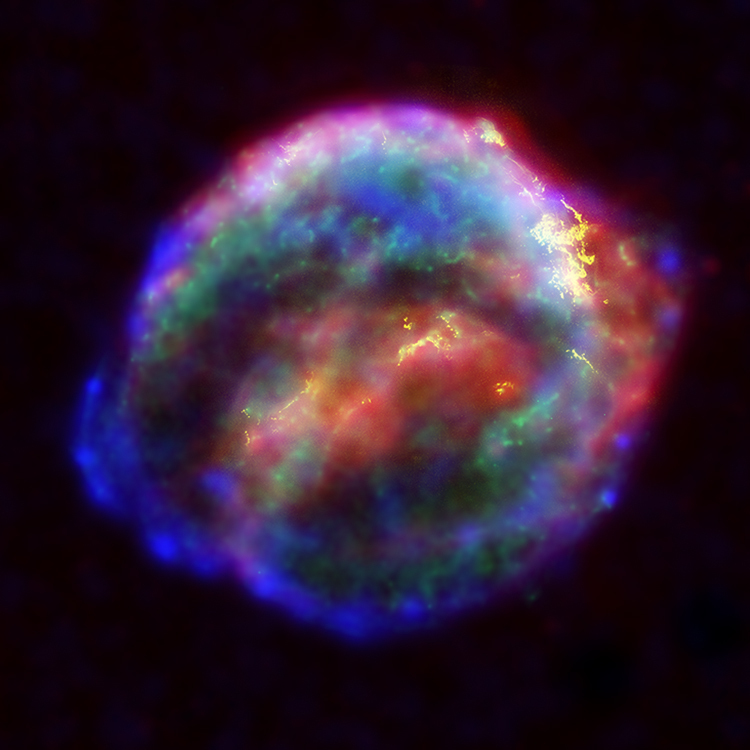 One of them involves these very supernovas. I don’t know the details. But it is quite simple to determine rough distances. The distance of nearby stars can be measured by parallax, i.e. how their positions against other stars changes as the earth moves around its orbit. From this we can estimate the typical absolute brightness of stars. We can compare this with the absolute brightness of stars observed in other galaxies, at least the nearer ones, and thus estimate their distances. And we can tell from this the approximate distance of some of the supernovas we observe. By these methods we can be very sure that these supernovas are more than 6,000 light years away. Peter, thanks. It’s my understanding that if the speed of light has changed, it’s still a constant anyway. I hope soon to read Schroeder’s, “God According to God.” Chosen at random. About the only meme some of them will not really consider is whether God created the natural order to look like a product old of cosmology with evolution following – as tests for the faithful. Such a test would mean that our use of reason is blasphemous. I’ll take the dilettante award for trying. And trust mercy will triumph over judgment. My commentary on what happens in inspiration is a bit whimsical. It’s meant more as my way to try to cut my own ignorance in half. I owe a hat tip for learning of Rabbi Anson Laytner, in “Arguing with God: A Jewish Tradition,” to a certain Jewish scholar where I studied. I won’t link the scholar. Why ruin his good name :)? Thanks again for your good work on this stuff. Dr. D. Russell Humphreys, a physicist, presents a view where the original universe, before light was created (and therefore the electromagnetic spectrum and therefore, also, time) was a ball of water 50 million lightyears across. As God created light (and therefore time, and therefore the first day), and then proceeded to move through the days of creation, the constituent parts of the universe moved through an event horizon (relative to earth). Thus, according to Einstein’s Relativistic equations, there was time dilation. The first parts to go through the event horizon at that time would appear, when viewed today, extremely old. His book, “Starlight and Time, Solving the Puzzle of Distant Starlight in a Young Universe” presents this view in a somewhat readable way. However, there are still equations as he interacts within the relevant Relativistic framework. Also, at the time of writing the book, he worked at the Sandia National Laboratory doing research in nuclear physics, geophysics, pulsed power, theoretical atomic and nuclear physics. Jim, I think I would agree that it is meaningless for a constant to change. As it changed the relationship between our standard metre and our standard second would change to match so no change could be measurable. Mike, Hartnett looked at Humphreys’ model and found some serious problems with it. I haven’t looked at them enough to know if they are fatal to his theory. Perhaps I should look more carefully. I should have read the article. So much to do, so little time. In any case, Hartnett does mention that his model is similar to Humphreys’. And, to my understanding (or, better, the lack thereof), it sounds quite similar. I wonder what Humphreys would say about the red shift versus blue shift issue? I would think he would have interacted with it. Yes, Mike, I’m sure there has been further interaction since 2003. But I don’t have time to look into it. I can’t help wondering if some of these models are in effect identical to the standard cosmological model but with different coordinates including one for time artificially stretched a few trillion times to make one day in that system equivalent to billions of years in regular coordinates. I’m sure it would be possible to set up such a coordinate system. I’m even more sure that that is not what the author of Genesis intended! The author of Genesis intended to convey 6 literal days, as evidenced by the Hebrew used; whether you except 6 literal days or not is another issue, but that was the intent of the author. As to the time/distance/light subject; much research has been done since 2003 and better models have been presented and the research continues. As to apparent age being considered in some way deceptive, what about Adam & Eve? They were not created as new born infants and as such did not experience childhood. Did trees before the fall have rings? No idea, and not particularly relevant as we will never know in this life. As to fossils, as mentioned by Wilberforce, he should have realised that the fossils were laid down by the Flood. Attempts to describe that as ‘local’ are fallacious to say the least. Glenn, thank you for your comment. I understand your viewpoint about the days in Genesis 1, but you need to accept that others have different viewpoints and there is no easy way to decide between them. The tree ring question is important because there are trees out there with more than 6,000 rings. At least I think there are, and there are certainly ice cores out there with more than 6,000 annual layers, in fact the record is close to a million. Issues like this need to be addressed in detail. I don’t know if they have been by any current creationist approaches. I think any properly trained geologist would tell you that it is quite impossible that all fossils were laid down in a flood lasting no more than a year. Are you aware of the amount of fossil bearing rock out there? I am writing from Italy in a house with a view of the Alps. Within sight there are thousands of metres thickness of largely fossil bearing hard rock, with deep valleys carved through them. It is quite impossible that all that was formed in one year, quite apart from how it was then raised up into mountains. I think most creationists now realise that and instead offer solutions that these rocks go back to the beginning of creation.